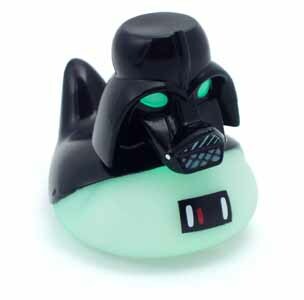 If you know a sci-fi fan who owns just about everything Star Wars related, then the Duck Fadar (be careful how you pronounce that) rubber duck could be the ideal gift. It won't break the bank and is sure to brighten up bath times - and could even be used to entice young children into the bath more regularly. When you place this in the water its belly and eyes glow, with the colour changing as it bobs around. I did seem to have a slight problem with mine in that it seemed to be oddly weighted more to one side. This had the undesired result that it would topple over fairly easily. There is something almost hypnotic about this item. I could have sat in the bath for ages just watching the colour changing. 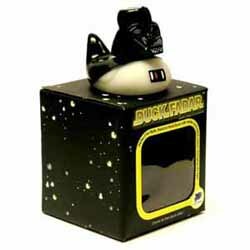 Duck Fadar consist of a sealed unit containing batteries and LED bulbs. According to the blurb on the back of the box the battery lifetime of the duck is about 45 hours use - this is the equivalent of 180, fifteen minute baths. The only problem I had with this is that the unit is sealed (with what appears to be glue) and the instructions claim that the battery is none replaceable. The odd thing is that the bottom looks like it would come off, if someone hadn't glued it shut. I've bought items like this before where it is claimed that it is not possible to replace the battery, but after dismantling them I've discovered that this was obviously just a ploy to get you to go back and buy another one once the battery has died. To be perfectly honest though, you should own a dozen or more of these and sit in the bath with the lights off. About the best fun you can have in the bath... alone... possibly. We compare prices online so you get the cheapest deal! (Please note all prices exclude P&P - although Streets Online charge a flat £1 fee regardless of the number of items ordered). Click on the logo of the desired store below to purchase this item. (All prices correct at time of going to press. Sci-fi Online regrets it can take no responsibility for price changes made by affiliate stores).